1.1 How to get Free 3g/4g data from Freeway? 1.1.2.1 How to get my unique invite link? and start reffering to Freeway? Freeway is one latest android app in this category. I think you guys already know about kickbit android app which is an old app that also works same as like this. Freeway works same as other free recharge providing apps. Free recharge providing apps like true balance, earn talktime etc provide free recharges for doing some tasks, here freeway app give you free 3g/4g internet data for completing some tasks. Freeway providing signup bonus and referral bonus also. Currently, they are giving 10 MB as signup bonus and 25 MB as the referral bonus. How to get Free 3g/4g data from Freeway? 2. Now open Freeway and enter your mobile number and continue to the app. 3. Now at the main screen,tap on the settings button and signup on Freeway. You can signup on Freeway using your email address or directly with facebook. 4. Yeah, after successful registration you will get 10 mb 4g data free. How to get my unique invite link? and start reffering to Freeway? 3. you can share your invite link directly to social networks or you can also copy the link. 4. start sharing your referral link with your friends. 5. For each successful signup to Freeway through your invite link, you will get 25MB free 3g/4g data. >> You can earn more free 3g/4g data free from Freeway by completing some tasks/offers there. The tasks are something like installing some apps / opening some apps . ** You can recharge earned free 4g data to your registered number. That is with freeway you can get free 3g/4g internet data on any network. I hope you guys enjoyed reading about freeway new free 4g data providing android app. 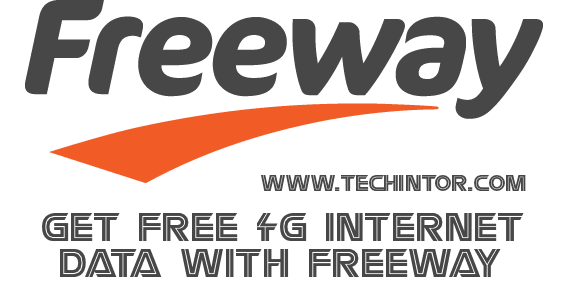 If you are an android user and looking for free 4g data tricks then Freeway is best choice for you. Thanks for reading our article. Please share this article with your friends though social networks also please keep visiting techintor.com for more stuffs like this.